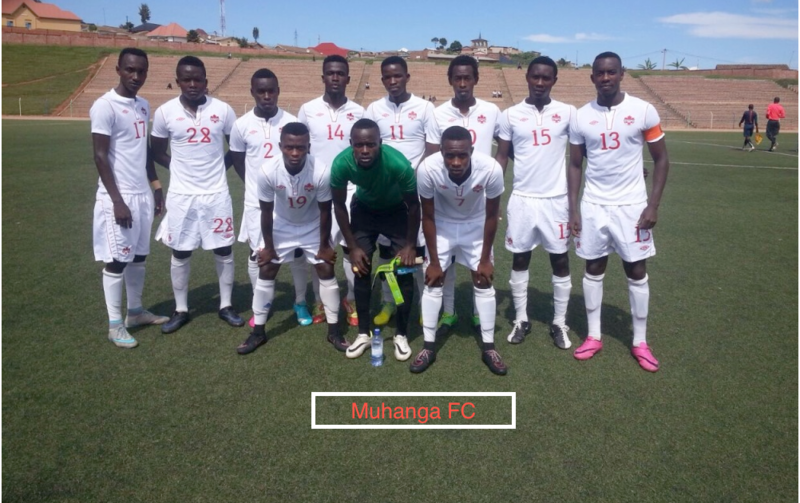 During the first quarter of 2017 much has been accomplished on the field in Rwanda. The 40’ container arrived safely allowing the team in Rwanda to start sorting and distributing books and sports equipment in establishing the next 16 District Youth Center Libraries. Our sincere gratitude to everyone who contributed to the 2016 and 2017 shipments. All individuals and corporates such as Riverside CC, CC Kelowna, Power to Change, MCC Centre, RR Plett Trucking, KMS Tools, Lantrax North America Logistics, Rotary Club Langley Sunrise, Royal Heirs, International Christian Response, Canada Soccer, and others for donating items and financial support. We would lik e to wish you a Merry Christmas and a Happy New Year. At the same time, we would like to update you on what the contributions received during this last year have accomplished by Grace Rwanda Society in partnership with its local sister organization, Ineza Foundation, a registered Rwandan Non Government Organization. Together we are changing the lives of children and youth in Rwanda. Grace Rwanda’s board member’s Paul and Elizabeth Johnson, relocated to Rwanda in January 2016, with the first container shipment, allowing them to initiate the opening of GR’s office and operations and open numerous community libraries. They since returned to Canada in October- November 2016 to load their second 40-foot container shipment of books, which will arrive in January-February 2017 allowing them to launch the next ten District Youth Center Libraries. 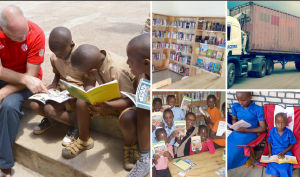 Grace Rwanda is committed to improving the literacy of children and Youth in Rwanda; therefore, they continue to initiate District Youth Center Libraries. The benefits of these libraries are to provide reading materials, dictionaries, and other educational materials by placing them in the hands of the children and youth that were not previously available. These libraries benefit children and youth by giving them a resource center and help them expand their knowledge, intellect and imagination. GR is committed to expanding partnerships with other stakeholders in promoting a reading culture in Rwanda. GR joined the Rwanda Reads platform and participated in various literacy activities in collaboration with other partners. International Language & Culture day: GR in partnership with MINESPOC hosted tent-booths where various local schools learned about what GR is doing in promoting local language books and local youth writers and publishers. Gisozi Reading Summer Camp: GR hosted a week long reading camp for 100 children and youth with the purpose of educating and providing extra reading and fun events for children and youth during school break. International Literacy Day: GR hosted a booth at the International Literacy Day joining other partners in celebrating and sharing the achievements in promoting a reading culture in Rwanda. As part of sustainable development initiative, GR is developing the Gisozi location for a community multipurpose hall that will be used for GR and Ineza office, training & literacy activities for communities. We want to thank Developing World Connections Teams: August and December 2016. The August Team installed the perimeter fence surrounding the upper lot of the Gisozi site, and the second team made 3,000 cement bricks for the multipurpose hall. One brick at a time, the team also built a security guard house, which will serve to secure the lower part of the plot, a green zone area that is being developed to make experimental community gardens to be used to train local farmers to maximize production on their land for personal food. Join us to make a difference, Donate. It is our hope that with your kind and generous support we all can help children and youth make a big difference in Rwanda. We hosted a Reading Camp from July 25 and 26th serving 100 children ranging from 3 years to 14years. We thank all international and local volunteers who made this event a success. Members of Coperative Tuzamurane with Grace Rwanda’s president Paul Johnson at the Bugesera library build. 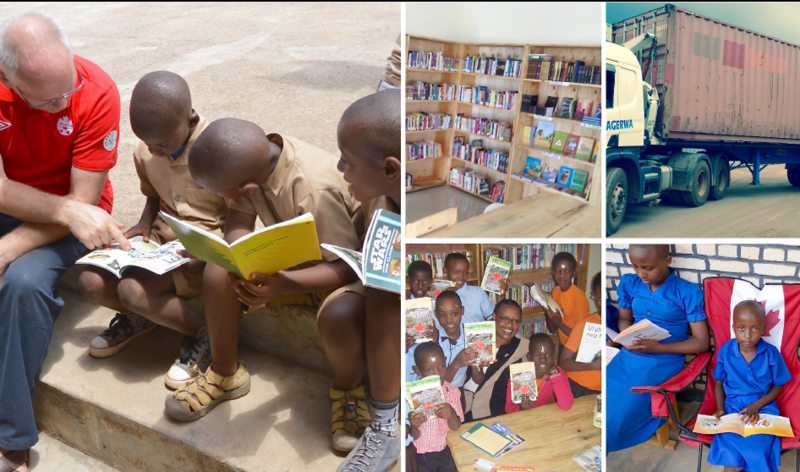 With our recent move to Rwanda, we’re now making huge strides in fulfilling our goal of setting up community libraries in each of the country’s 21 major sectors. And we’re doing it in partnership with youth who need employment. Last month we completed the installation of the Kimisagara community youth library. It’s stocked with books are we’re excited to formally launch it with a community and school celebration in partnership with the Rwandan Ministry of Youth and Information and Communications Technology. Stay tuned for updates on this exciting event! This month, we’ve been working on setting up our next library in Bugesera. We’ve completed the painting and are now working with youth who have graduated from the Iwawa Youth Rehabilitation Centre (a facility for former street youth where they learned trade skills) to build the shelves, tables and desks to furnish the new library. These youth, who have formed a 35-member carpentry co-op called Coperative Tuzamurane with the help of a government grant, are doing incredible work, turning their lives around and becoming leaders in their community while earning a living. Some of these young men were former orphans, drug users or involved in petty crime. They are now fathers, peer mentors and entrepreneurs. To help support them, we hope to include their work in our next youth centre library in Iwawa and perhaps all of our upcoming libraries. In the meantime, we helped the young men in this coop celebrate their first anniversary of their business with a party and some cake. We donated some soccer balls and jerseys to the group in thanks. It’s been a rewarding and inspiring few months in Rwanda, with lots to show for our efforts. Thank you again for all your support which is making our mission of literacy possible. Elizabeth Johnson shows some of the books donated to Rwandan librarians recently trained in Kigali. Just a few months after arriving in Rwanda to focus more on local operations, Grace Rwanda’s leaders are already in the news. Elizabeth Johnson was celebrated for her literacy promotion work with Grace Rwanda in a feature story in Rwanda’s The New Times newspaper the other day. The paper is the leading English-language daily in the country. The piece, titled, “Empowering community-based librarians to serve,” focused on a recent workshop to train librarians held at Kigali Public Library. The librarians, brought in from all over the country, were trained in library management, cataloguing, book recording, and filing to improve their skills. The Rwandan government has made increasing literacy in the country a priority. Grace Rwanda believes that educating librarians is a great step to empowering Rwandans to foster greater literacy among youth. To that end, our organization donated 150 dictionaries to the librarians to support their literacy efforts, and our efforts were noted in the article. Elizabeth Mujawamariya-Johnson attended the workshop in her capacity as a member of the Rwandan diaspora working in international development. She recently returned with her husband from Canada for permanent stay in Rwanda. While still in Canada, she had initiated an organization called Grace Rwanda Society based in Langley, British Columbia in Canada. In 2014, she decided to create a sister organization that would act as a local NGO, hence the birth of Ineza Foundation. “In January I moved to Rwanda full-time with my husband to kind of increase our capacity so we can open the office and be able to assemble an operational team here for Ineza Foundation so they can be the ones to implement all the projects for Grace Rwanda Society,” Mujawamariya-Johnson explained. The foundation recently signed a memorandum of understanding with the Ministry of Youth and ICT to equip 21 community libraries across the country under their respective district youth centers. The first two beneficiaries were; Muhanga Youth Center in Muhanga district, Southern Province, and Kayonza Youth Center in Kayonza district, Eastern Province, which were equipped with books, computers and e-readers. Read more of the article on The New Times web site. And check back for more updates from the field as we continue to ramp up our youth literacy work in Rwanda. L to R: Paul Johnson, Vanathy Ravindran, K. R. “Ravi” Ravindran, Florianne Nibakure and Elizabeth Johnson. Grace Rwanda has long been supported by the selfless volunteer work and the generous donations from local B.C. Rotary Clubs including the Rotary Club of Langley Sunrise and District 5050. That’s why we were thrilled to meet with Rotary International leadership in March at an event in Rwanda. Elizabeth and Paul met Rotary International President K. R. “Ravi” Ravindran and his wife Vanathy during one of their visits to the African nation. The couple were joined by representatives from the 10 central African countries of District 9150. The Johnsons also met with the president of the Minneapolis University Rotary Club, Florianne Nibakure. She is also working in Rwanda, as the founder and executive director of the Nibakure Children’s Village in Rwanda. Rwanda’s First Lady, Jeanette Kagame as well as Rwanda’s Minister of Education and Minister of Health also attended the celebration. It was a very special moment and we were able to express our thanks for all the assistance that Rotarians have provided us over the years. As part of the visit, the president toured a library funded by Rotary five years ago. It is the last one they have built on their own. Grace Rwanda is proud to be taking up the cause in building our own youth centre libraries, with the next one in Kimisagara set to open this spring. Our libraries were made possible in part through the thousands of dollars donations and thousands of dictionaries supplied by our own dedicated Rotary partners in B.C. We extend you a heartfelt thank you. We are happy to be joining so many other Rotarians in bringing literacy to Rwanda. Stay tuned for more updates on our work.